The December issue of Wargames Illustrated is available now! As always, the magazine comes in three different formats – Print, Interactive (for iPad), and PDF – as part of your WIPrime membership. 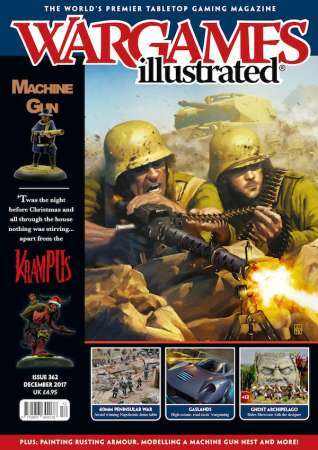 The theme for this issue is The Machine Gun, and we present six articles on wargaming with this revolutionary weapon. Mike Bradford discusses the history of this iconic early machine gun and how it may be used during tabletop encounters. We venture forth on an adventure to the Lost Isles trying out these new Osprey rules. Jim Graham takes a close look at machine guns in World War One and considers how to use them in our games. In the spirit of the Christmas season, we present a game that the whole family can enjoy, if they are of a certain mindset. From dropped bricks and sidearms, to Maxims and Lewis guns, the evolution of aerial warfare is directly linked to the creation and usage of the machine gun. Weld on some armour plating, create a housing for a weapon or two and top off that gas tank – we provide an insider’s look at these new rules from Osprey Games. Exclusive rules for using our latest Giants in Miniature figure with Dracula’s America. THEME: WHERE YOU GOING NOW? Dom Sore takes us through the history of World War Two machine guns and how these work with various rule systems. Following on from our Cavalry theme in WI361, Nick Buxey presents an insight into a brave group of men who overcame prejudice to fight for their country. Here in the WI Studio, Jamie Walker had a play around with creating a model of an improvised site for a MG and its crew. We caught up with Ian Smith to talk more about his wonderful 40mm Napoleonic game – one of the award winning tables at The Other Partizan this year. Just how can you give your armoured warriors that ‘weathered veteran’ look? Perhaps by adding some rust to their armour using these simple techniques. Inspired by our recent Dunkirk themed issue, Gary Mitchell takes us through a German World War Two evacuation. Another great game from Partizan, themed around an epic naval battle from the Russo-Japanese War of 1904 – 1905. We take a tour of (Wargames) Foundry’s production facility and store at East Stoke Hall in Nottinghamshire. Every gamer has one, that collection of miniatures that are just waiting for a little bit of attention, whether lead, pewter, plastic or resin – it’s time to discuss the Sassanid elephant in the room.